Sunny Valley, about fifteen miles north of Grants Pass, Oregon along I-5 is perhaps one of Oregon’s most historic, yet least known locations. Unfortunately that has not always been happy history. In the Fall of 1846 the first Wagon Train to pass through Southern Oregon on it’s way to the Willamette Valley and by extension, Oregon City, stopped by what was then known as Woodpile Creek. One of the members of the train, Martha Leland Crowley, 16, died that night of typhoid fever. Her fiance, a carpenter, built a simple wooden coffin and buried her here before the rest of the wagon train went on. Lewis A. McArthur states that her sister Matilda, brother Calvin, as well as his wife and child had already died on the trip. Her father Thomas Crowley also died in Oregon, but her mother Catherine Linville Crowley went on to marry James M. Fulkerson in 1848. In the summer of 1848, having just recently finished his term as a Militia Captain in the Cayuse Wars, James W. Nesmith and a party of gold seekers headed towards California came across the grave which had been desecrated by Indians. They reburied the body and renamed the location Grave Creek. James H. Twogood came to Sunny Valley in 1851 to lay out his Donation Land Claim here. 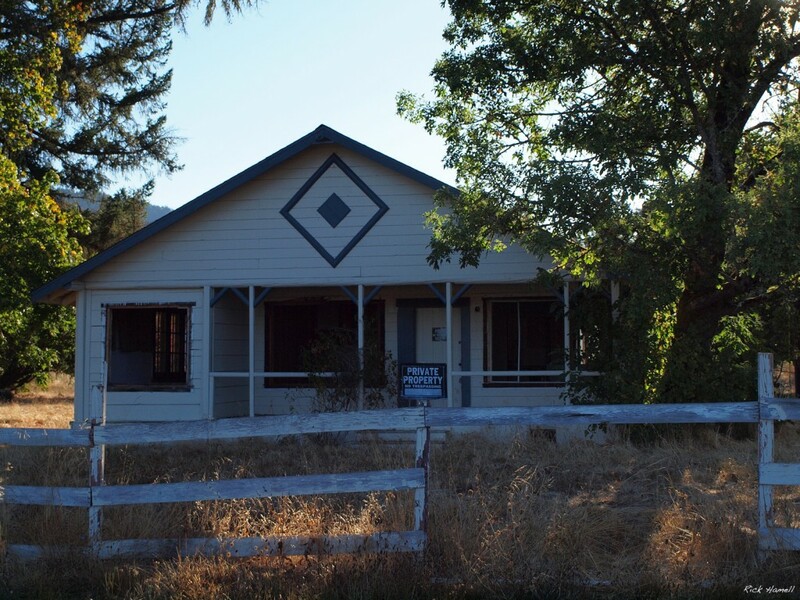 By doing so he cemented the name by calling his land “Grave Creek Ranch,” in memory of Martha Crowley. With him a man named Bates who helped run the ranch and packed goods to the nearby mines to sell to miners. Cow Creek is located about 30 miles north of Grave Creek via I-5. This is where the Cow Creek Umpqua tribe lived. They were related to the Grave Creek Umpqua Indians who had been inhabiting Sunny Valley. “During the summer of 1851 it was rumored that there was a non-indian child among the Cow Creeks. Cpt. Remick A. Cowles, with a party of men visited Quintiousas camp on Council Creek to investigate. On making the object of their visit known, Tipsu Bill, armed with a rifle and followed by an Indian woman and an Indian girl about eight years old presented themselves, and by sign language stated that the Indian woman was his wife and that the little girl was their child. On examination, the whites were satisfied that the child, although lighter than the average Cow Creek, was unmistakably Indian. Tipsu Bill was not a native Cow Creek, but was adopted by the tribe. His homeland was somewhere near Butte Falls in Jackson County and he was likely a Molalla, and on account of tribal conflicts had migrated to the Umpqua country. With him had come, besides his wife and children, a younger brother about 15 years old named Jack, and an elderly man named Skunk, and a family, about ten in all. At Grave Creek I stopped to feed my horse and get something to eat. There was a house there called the Bates House, after the man who kept it… Bates and some others had induced a small party of peaceable Indians who belonged in that vicinity to enter into an engagement to remain at peace with the whites during the war which was going on at some distance from them and by way of ratification of this treaty invited them to partake of a feast in an unoccupied log house just across the road from the Bates House, and while they were partaking, unarmed, of this proffered hospitality the door was suddenly fastened upon them and they were deliberately shot down through the cracks between the logs by their treacherous hosts. Nearby, and probably a quarter of a mile this side I was shown a large round hole into which the bodies of These murdered Indians had been unceremoniously tumbled. I did not see them for they were covered with fresh earth. The above account agrees in most particulars with the account George Riddle had from Jack, a brother of Tipsu Bill, and two Grave Creek youths who made their escape and made their home with the Cow Creeks for two years afterward. It appears that after the Grave Creeks were rounded up in the log house as related by Judge Deady they were informed that their lives would be spared on condition that they would bring in the head of Tipsu Bill, who was encamped on Grave Creek a few miles below the Bates House, with his small band and engaged in hunting deer, Tipsu Bill being the only able-bodied man of the party. The Grave Creeks, thinking to save their own lives, detailed part of their band to bring in Tipsu Bill’s head. They found Tipsu Bill in his camp, who being at peace and unsuspicious of visitors, they treacherously shot and carried away his head to their unscrupulous non-indian captors, supposing they would soon be released, but in this they were soon undeceived, for they were all shot down as related by Judge Deady. The two Cow Creek youths came in sight while the shooting was going on and, sensing the difficulties, ran for it. The exterminators turned their guns on the young men and hit one of them in the heel, but they made their escape. Somewhere about this time, McDonough Harkness bought out Bate’s interests, including his portion of the business packing goods to the local miners. The place was known as both Grave Creek House and Leland Creek House and was an wayside and hotel/tavern for travelers. Harkness and Twogood fortified the building for protection against the Indians. For unknown reason (as far as I can research,) the Oregon Legislature passed an act renaming Grave Creek to Leland Creek in January 1854. While the sentiment in honoring Miss Martha Leland Crowley was no doubt appreciated, the public didn’t take to the new name at all and Grave Creek remained in common use. On March 28, 1855, the Leland Post Office was established. Harkness held the office of first Postmaster. At the start of the Rogue River Indian Wars, Fort Leland was established here. The fort was built to encompass the already fortified hotel and tavern, later becoming the gathering point of a large force of Regular Army and volunteers. The Fort was disbanded in 1856. Many of the dead from this battle were buried near the fort. James Twogood took over operation of the Post Office after Harkness was killed on April 27, 1856 near the lower Rogue River while riding dispatch by Indians. His was among the last of the deaths in the Rogue River Indian war, before the Indians were resettled to the Grande Rhonde Indian Reservation under the watchful eyes of Fort Yamhill. 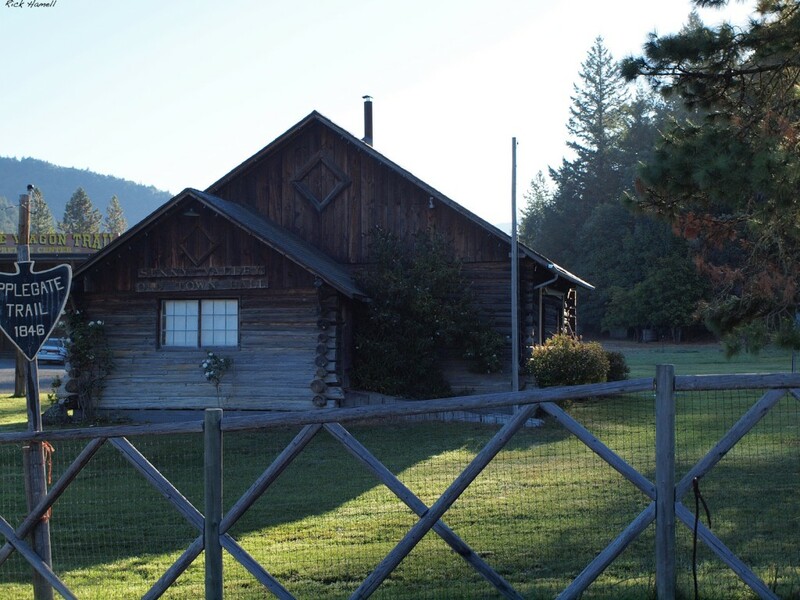 Twogood sold out the rest of the interest in the land and the hotel in 1860 to the Harkness family, who ran the Grave Creek Ranch as a stage stop on the California Oregon State Line. They added a second building calling it Grave Creek House #2. That building burned down in December 1875, but was replaced by enlarging a nearby farm house (perhaps Twogoods original house?) and renaming it to Grave Creek House #3. President Hays spent the night there on September 28th, 1880. The railroad came to Leland in 1880, where a station was built about four miles west of the town and named Altamont. A post office was established there, but it closed in 1886. The Leland Post Office was then moved to that location in 1888, where it stayed until closed on April 30th, 1943. In 1920 a contract was awarded to J. Elmer Nelson by the Oregon State Highway Department to build a bridge across Grave Creek. It was finished four months later at a total cost of $21,128. 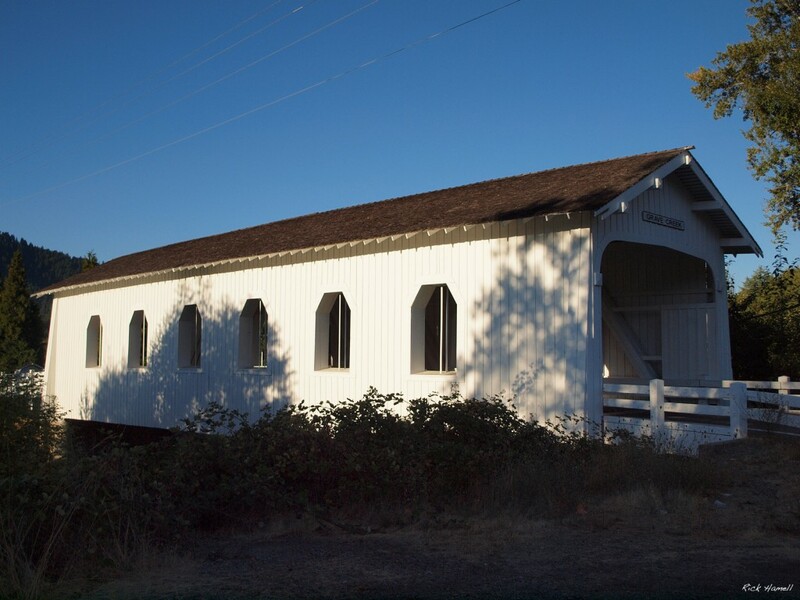 This bridge still stands today and is the only Covered Bridge Visible from I-5. These days Old Leland is barely a memory. The town center long moved to closer to the location of Altamont has massively declined, no sign of the train station exists any longer. The Applegate Trail Interpretive Center, along with the Grave Creek Covered Bridge, dominate Sunny Valley. Neither see much traffic despite that. 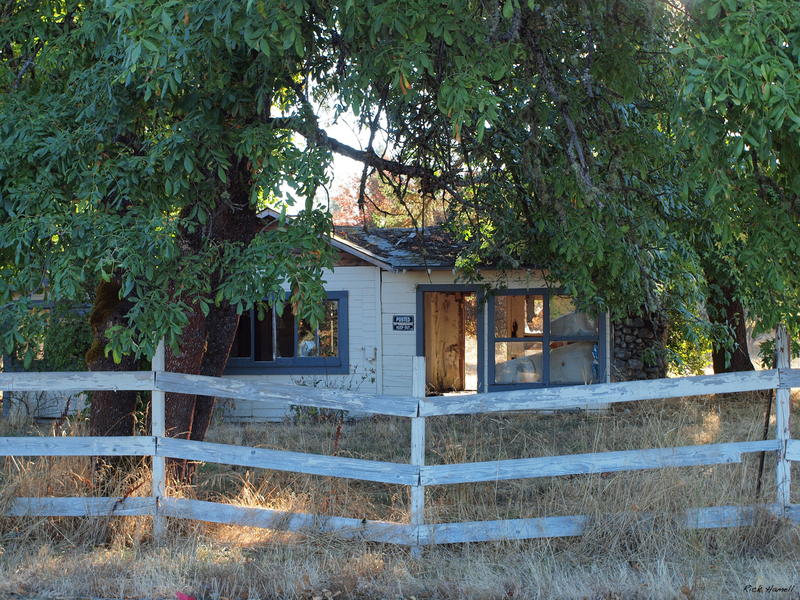 Above is the “old town hall,” now part of The Applegate Trail Interpretive Center. Nearby are a few abandoned houses.